If I was only going to do one exercise to improve my position while jumping, what would it be? Hands down it would be the squat! 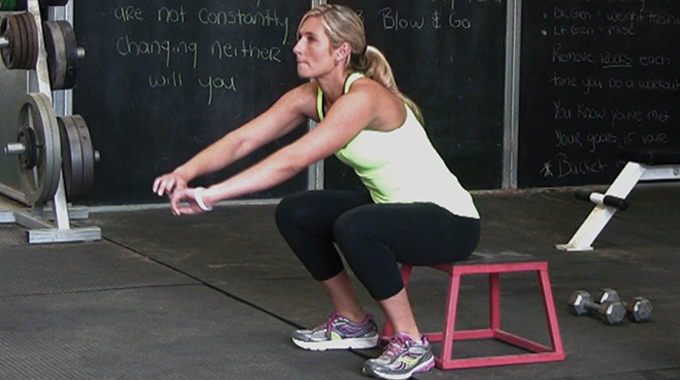 A correct squat perfectly mimics a correct position over fences. 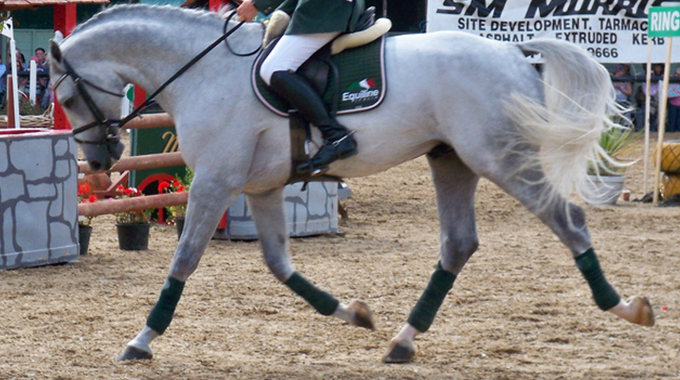 I see many riders standing up in their stirrups in the air and pushing their hip forward (hands coming up) rather than hands forward, following the horses mouth and hips moving backwards. This habit is very difficult to address while on the horse. I’ve found much more success by having a rider practice a squat off the horse using a bench that is approximately the same height as their knees. Stand with your backside facing a bench or chair, ideally the same height or lower than your knees. Pushing your hips back, reach for the bench with your bottom. Eyes and chest should stay up, not collapsed, hands in front of you as if you were holding your reins. The key to keeping your weight evenly balanced is to raise your big toe up just enough to touch the inside of your shoe. The biomechanics of lifting your big toe are the same as putting your weight in your heels when in the stirrup. After lightly grazing the bench push your hip forward to arrive back at the standing position then repeat. Try doing 3 sets of 10 repetitions daily then see how your position in the air improves. Happy riding! 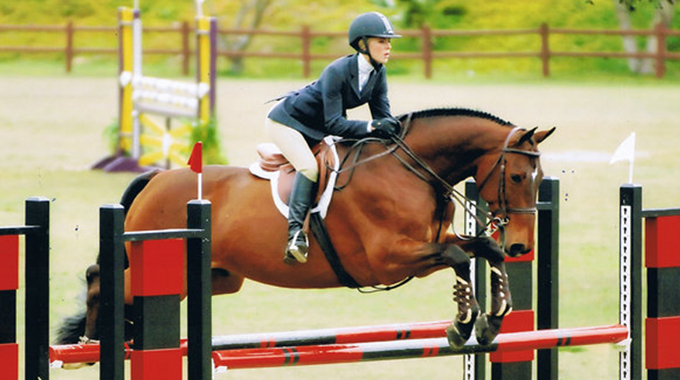 As a rider, you want your time in the gym to enhance your performance in the saddle. 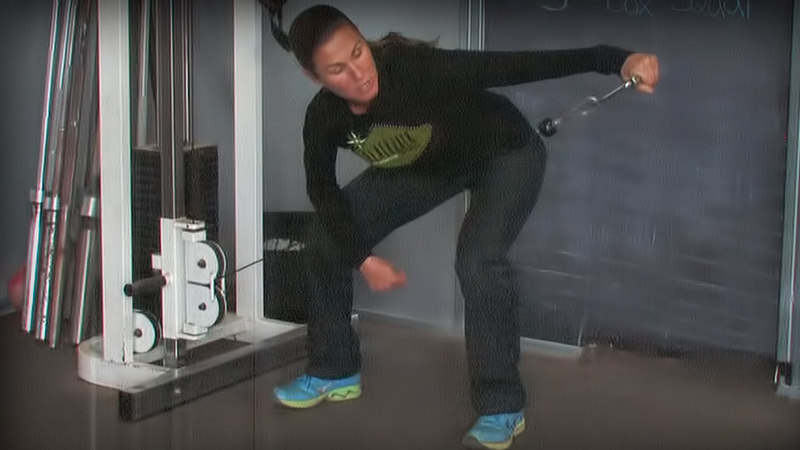 Join rider & fitness expert, Robin Martinez, as she shares exercises specifically designed for the unique requirements of an equestrian athlete. 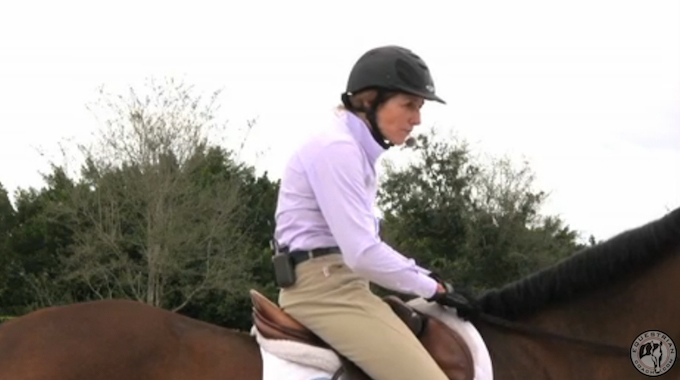 As a rider, fitness expert Robin Martinez, knows how hard it is to get to the gym during show season. You arrive at the show grounds at the break of dawn for the first class and can’t leave until the horses are snuggled in their stalls for the evening. Robin shows us how to maximize our down time in between classes and get in a great workout, whether it’s back at the hotel, in the RV or even in the barn aisle! Bernie answers a member's question on how to correctly position his leg so it stops swinging.